Treat your belly button piercing to some cute Halloween bling with our range of gorgeous Halloween belly button bars. These belly bars come in a great choice of designs and styles, from classic skulls to creepy zombies and glam polished silver. They look stylish long after Halloween is over, so you get a great new look that you can enjoy all year round. Below are some of our favourite Halloween belly bars. 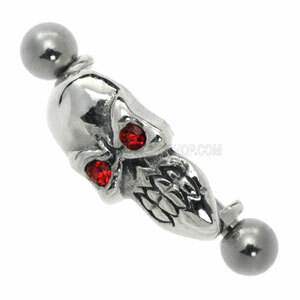 Cute and classic, these skull belly button bars are perfect for Halloween and look gorgeous all year round. 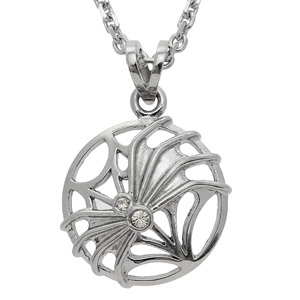 They feature three-dimensional skulls and come in a great choice of designs. All of these belly bars are made from high quality surgical steel, so they are very comfortable to wear. 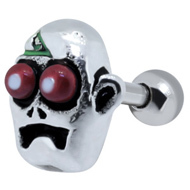 The Disco Skull belly bar features an enameled skull, but the bar and ball are surgical steel and the enamel does not come into contact with your piercing. All four bars are stunning and would make a sweet Halloween gift. 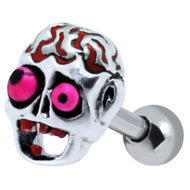 If you fancy something special, check out our silver zombie belly button bars. These eye-catching bars feature solid silver zombie charms with gold-plated detailing. The silver has a wonderful shine and these belly bars are truly beautiful. They catch the light and add a glam twist to your Halloween look. Each zombie belly bar has a surgical steel bar and ball, so they are very comfortable to wear and will not irritate your piercing. A gorgeously spooky gift. This entry was posted in Festive Body Jewellery, Navel Bananabells and tagged Belly Button Bar, Belly Button Bars, Halloween Body Jewellery, Halloween Jewellery, Halloween Piercing Jewellery, Jewellery For Halloween on October 16, 2013 by Piercing Guru. 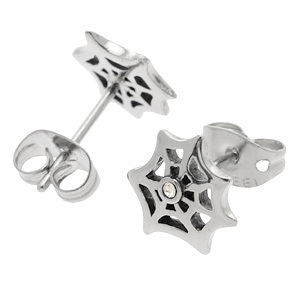 Add some Halloween flair to your outfit with our great new range of Halloween ear piercing jewellery! 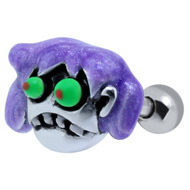 These ear piercing studs are silly but scary, the perfect way to get into the Halloween spirit. Halloween jewellery can be overly gothic, but these ear piercing studs combine super-bright colours with scary skulls and cute glitter. 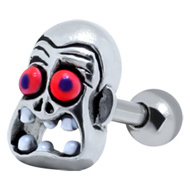 They are as goofy as they are freaky and add a little fun to your Halloween look. This range of Halloween ear piercing jewellery is made from high quality surgical steel, including the fronts, posts and threaded balls. 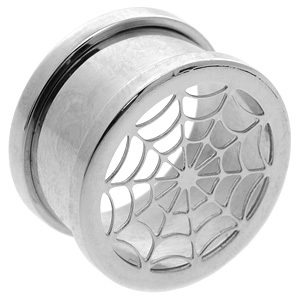 This means that they are very comfortable to wear and will not irritate your piercings. 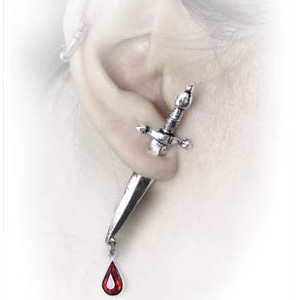 They are versatile and can be worn in earlobe, helix, conch and tragus piercings. Silly and cute with a side order of gore, these Halloween ear studs are a great choice throughout the Halloween season! This entry was posted in Ear Studs and Earrings, Festive Body Jewellery and tagged Ear Piercing Jewellery, Ear Piercing Studs, Halloween, Halloween Body Jewellery, Halloween Jewellery, Halloween Piercing Jewellery, Jewellery For Halloween on October 4, 2013 by Piercing Guru. Get in the (spooky) festive spirit with our awesome range of skull piercing jewellery. Whether you want a finishing touch for your Halloween outfit or an edgy new look, skull jewellery is a great way to show off your piercings. 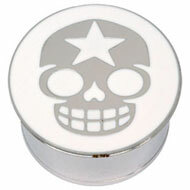 From sparkly skull earrings to rockabilly skull plugs, we have a great range to choose from. 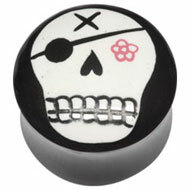 We have a fantastic choice of skull navel piercing jewellery, including ball closure rings and bananabells. It’s important to make sure you choose the right shape skull bananabell for your piercing. Dangle belly bars like the crystal skull bananabell are a great option because they make a statement but are also comfortable to wear. The large area of a flesh plug is ideal for making a statement. 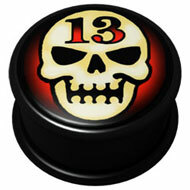 These skull flesh plugs are some of us best-sellers and they come in a fantastic choice of different styles. Our skull stretching jewellery includes lots of different materials, so you can choose the best type of plug for your stretchings. This entry was posted in Navel Bananabells, Stretching Jewellery and tagged Body Piercing Jewellery, Gothic Skulls, Halloween Body Jewellery, Halloween Piercing Jewellery, Skull Body Jewellery, Skull Piercing Jewellery on October 30, 2012 by Piercing Guru.